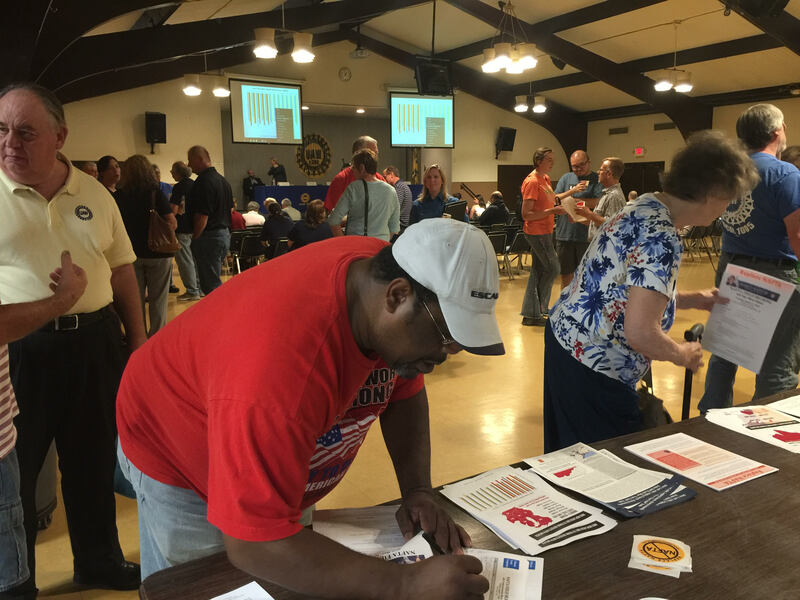 Last night workers in Missouri organized, voted, and WON BIG. On the ballot was Prop A, a so-called “right to work” bill that would’ve limited workers’ rights to stand together, form a union, and earn better wages. But workers refused to back down and voted to defeat Prop A by a 2-1 landslide. I’m fired up because the same strength we built through organizing, marching, and striking – the strength that won us raises for 26 million people nationwide – is the strength that’s going to take back power for working people in November. Share this image to show the corrupt politicians and greedy corporations that their time rigging the system is about to expire. Thanks for standing with us – in the workplace, in the streets, at the ballot box, and beyond. We cannot simply chant “more funding for organizing” or “elect more Democrats” as important as both may be. Union funding of great organizers cannot overcome the stacked deck of employer opposition and so-called corporate free speech in workplace-by-workplace organizing. And all too often the political demands on elected Democrats don’t go beyond short-term transactions that are defensive in nature. The 2018 teacher walkouts and resulting statewide negotiations in West Virginia, Kentucky, Oklahoma, and Arizona signal a new opportunity for workers in the U.S. : sectoral bargaining, familiar to teachers and other workers around the world. Rather than negotiating with each school district, teachers in the four states with strikes, at least to some extent, and with varying results, were able to negotiate statewide, not only on key issues affecting them but also on state funding of education. And the results have been unprecedented. In states like New Jersey and New York with practically wall-to-wall public-sector union representation, years of negotiations with hundreds of individual local school boards have produced much higher wages, but many other issues, like class size, school vouchers, and privatization, are off the table. With sectoral bargaining, collective bargaining itself is not a factor in union organizing, but the effectiveness of bargaining is very much connected to the membership level and solidarity of workers in those sectors. In the U.S., at one time, unions in auto, steel, rubber, and other industries bargained jointly with employers or at least set patterns on wages and benefits. But industry bargaining was never supported by law and, as new employers gained market share and opposed union representation, enterprise bargaining declined. A version of industry or sector (sectors like manufacturing can be broader than one industry) bargaining persists, for example real estate developers in some cities negotiate jointly with building trades and building services unions, but examples are rare. Similarly the Railway Labor Act provides for craft based national bargaining, and in the rail sector bargaining occurs with multiple employers and crafts. When U.S. bargaining coverage and rights at work are compared to other nations, the case for change is clear. In nearly every other democracy, collective bargaining coverage in the public sector has been nearly universal for decades. And many countries have fifty per cent or more coverage in the private sector—mostly the result of widespread, nearly universal sectoral bargaining. For example in 1995 the new post-apartheid South African government was able to legislate sectoral collective bargaining and sectoral minimum wages as key parts of their initial economic agenda. Finance workers in Brazil bargain for their sector with employers that include all the major U.S. banks, and as a result, wage rates in the Brazilian finance sector for back-office and customer service staff are higher than the U.S.
Public and private sectoral bargaining results in Europe are well documented, and even conservative political parties like Angela Merkel’s Christian Democratic Union (CDU) in Germany view sectoral bargaining as a way to engage workers and employers while maintaining a broader focus on jobs as well as wages. The CDU and employer federations realize both that worker participation has not only social value but also provides economic stimulus through wages versus government spending. …the new post-apartheid South African government was able to legislate sectoral collective bargaining and sectoral minimum wages as key parts of their initial economic agenda. In Norway a national wage negotiation precedes sectoral bargaining and both unions and employers are mindful of the responsibility to balance productivity gains, jobs, and wages with an eye on tradable sectors, where jobs can be exported to a country with lower labor costs. As a result, in Norway cleaners and unskilled construction workers enjoy sectoral wages of about $25 an hour while skilled workers in manufacturing and services earn about 50 percent more, but still within a range that incentivizes investment. In addition, the political consequences of high levels of union membership have provided much of the support for universal health care, childcare, tuition-free higher education, and home health care for seniors. As we discuss a new framework for U.S. workers’ rights, we must ask, “Do we believe that we can win?” U.S. workers and our organizations need to aim higher and not accept arguments about U.S. exceptionalism that reject new approaches in a global economy that has left U.S. unions on defense for decades both at the bargaining table and in organizing. If we were to build a movement for universal sector-based bargaining rights in the U.S., how would we do it? The answer begins with unions and community and political allies, and a grassroots as well as legislative strategy realistically focused on congressional Democrats, and demanding the Party’s serious commitment to collective bargaining rights. All too often commitments to workers’ rights, and other issues, is political speak but not with the fervor or focus necessary to accomplish real change. There is already a foundation of grassroots work in cities and states raising the minimum wage, adopting scheduling notice for retail workers, paid family leave, and more. It is clear for those fighting for rights at the local and state level that federal reform is slow and out of reach. But at the same time these initiatives should be viewed as instructional, much like the teacher strikes, demonstrating what is possible as well as key elements for future mobilization. The Fair Labor Standards Act, which sets a floor for minimum wages, does not preclude sector-based minimum wage campaigns in cities and states. Imagine a minimum wage for transit workers of $25 an hour in key cities like Washington, D.C. where massive privatization of bus routes and paratransit has undercut union jobs while offering city government a cheap way out. A municipal campaign in a city like Philadelphia could provide for a $25 an hour or higher wage for construction or communications techs, eliminating much of the incentive for low-wage bids and boosting the standard of living across the city. Why are pay standards like those possible in Oslo but not Washington or Philadelphia? Broad community support has been a key factor in the teachers’ strikes in the toughest states. Similarly this support would be critical in sectoral minimum-wage campaigns. Community support for higher wages can also transfer to support for broad sector-based bargaining rights once we create a dialogue about how this can provide a decent standard of living, rights at work, and a sustainable economy. Bringing this campaign forward as an urgent and critical economic issue for Democrats is key for credibility; support for collective bargaining needs to be more than a slogan for Labor Day. In 2007 when Speaker Pelosi helped lead passage of the Employee Free Choice Act in the House by a wide margin (Senate supporters could not muster the 60 percent needed for a vote, nearly every Democrat supported the act as well as 16 Republicans). Since then those Republicans have retired and the Republican Party outright opposes collective bargaining, a total reversal in the 40 years since President Ford supported and signed the extension of the National Labor Relations Act to hospital and other non-profit employers. We need to be clear that universal sectoral collective bargaining rights would do far more to stimulate economic growth and reduce inequality than well-deserved increases in the minimum wage. This cannot be simply a policy argument, but must be a political demand backed up by increasing militancy across sectors as demonstrated by teachers and fast-food workers. If we don’t demand support from Democrats we will never get it. If we build support inside the Democratic Party and insist that there is no path to real economic justice without it, our political work can lead to real change. Several states including California, New York, and New Jersey have had some success with wage boards, which have included management, union, and public members setting standards in certain industries and occupations. Most recently in 2015 in New York, the state wage board authorized a $15 hourly minimum wage for fast-food workers that are part of chains, phased in over six years. State-based initiatives like these can provide positive examples, but workers in the U.S. need to organize for collective-bargaining rights, as our predecessors have done for generations. We want and demand self-organization where the strength of the union rests on the strength of our organizing. …universal sectoral collective bargaining rights would do far more to stimulate economic growth and reduce inequality than well-deserved increases in the minimum wage. We can win more for U.S. workers with universal sectoral bargaining supported by law, but based on organizing. The details on sector composition are complicated (and left for further discussion) since unions would bargain together; and with sectoral bargaining there can be competition for members. But we need to face the huge limitations of U.S. private-sector enterprise bargaining and the near total collapse of enterprise organizing compared to the growth of the labor force. Current statutory exclusions in the U.S. include not only contractors and temp agency workers, but a federal sector consigned to negotiating merely working conditions and disciplinary procedures, and the majority of states blocking bargaining rights for local and state employees. Assuming sectoral bargaining gains broad-based support, next would come an outline of specifics, including proposed sectors, and the mechanisms to insure employer and union roles and participation. We are not starting from scratch; global research from a range of nations already documents various approaches. Additional organizing campaigns, including sectoral minimum wage campaigns, could be followed by drafting federal legislation and then the tough campaign for passage. As with the yet unsuccessful Employee Free Choice Act, this campaign will take years, but is there an alternative that can lead to real change? While 15 million union members can certainly help lead this movement in the U.S., particularly in the Democratic Party, the value of effective bargaining rights for the majority of the U.S. workforce needs to be central to building a broader political movement. Unions in South Africa were bolstered by the much stronger African National Congress when sectoral bargaining was adopted there. Conversely in Chile, coup leaders advised by U.S. right-wing economists, were quick to dismantle collective bargaining as they gutted the rules governing their democracy in multiple ways. We need to learn from examples in our own history, as well as other nations, that we cannot separate larger economic gains from building a broad movement for political change. Progressive political groups should join this discussion since economic equality and opportunity is at stake and nothing significant will be adopted without massive public support and organizing. This is not mainly about union growth as important as that might be, it is about the economic direction and growth of our nation. …effective bargaining rights for the majority of the U.S. workforce needs to be central to building a broader political movement. There are no quick answers to an 80-year slide in workers’ rights. The decline was partially obscured by the rise of public-sector collective bargaining in many of the largest states, and in those cases at least maintaining the political clout of labor despite the collapse of union manufacturing jobs. But now the consensus is growing that we need much deeper change. Larry Cohen chairs the board of Our Revolution, the successor organization to Bernie 2016, and is the past President of the Communications Workers of America.